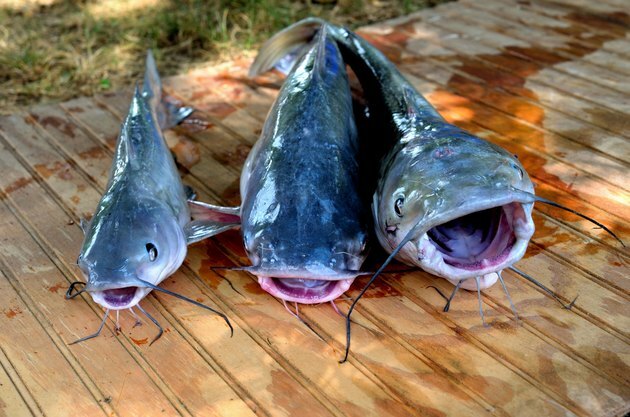 Many owners of man-made ponds stock catfish, particularly channel cats, as a part of their pond management strategy. In these ponds, catfish are relatively easy to catch and can be a lot of fun, particularly for youngsters just learning about fishing. A little knowledge of how pond-raised catfish behave, the pond structure and the right gear can help make your next fishing trip a successful one. When fishing from the bank of a man-made pond, use a long fishing rod. A rod 7 feet or longer will provide better casting ability, more tip sensitivity when catfish strike and better hook-setting and fighting control. During the heat of the day, catfish often retreat to deeper water. Try fishing in deep holes and around the base of any dams or water spillways. The mouths of any feeder creeks or other inlets to the pond can also yield catfish. Catfish frequently move into the shallows to feed at night when temperatures are cooler. Concentrate your fishing in these more shallow areas, where catfish look for worms, crawfish and other prey. If any structure was added to the pond when it was constructed, catfish will often congregate there. If you know of any sunken logs, trees, rock piles or other structure placed in the pond when being built, target those areas first. Once you have located a likely area where catfish may be in the pond, try still fishing that area. Use a rig with an egg sinker on your main fishing line. This weight will keep your bait on the bottom where catfish are more likely to feed. It will not take long for catfish to find your bait in a small man-made pond. If still fishing on the bottom isn't working, catfish may be feeding higher in the water column. To accommodate this situation, suspend your baited hook not too far under a bobber and drift your bait along with the wind. This will help you cover a larger area and acts as a clear signal if you catch a fish. Many owners of man-made ponds stock catfish. To get them to fishing size, they often feed them with prepared, pelleted fish food. Try to get some of that food to chum the water in the area you wish to fish. This will stimulate feeding and make your bait that much more attractive. Some man-made ponds that are stocked with catfish may have automatic fish feeding stations positioned around the pond. These fish feeders will often condition catfish to remain in that area, expecting food at regular intervals. Fishing around these feeders may result in more catfish caught. Natural baits are usually best for pond-raised catfish. Earthworms, insect larvae, such as mealworms or Catalpa worms, crawfish, shrimp and cut bait all work well. You can also try chicken livers, or prepared dough baits or stink baits. Live minnows, sunfish and other bait fish can introduce diseases into otherwise healthy man-made ponds and should not be used for bait.